Turning Point Episode Reminder Get a sneak-peek into each new show, delivered straight to your inbox! 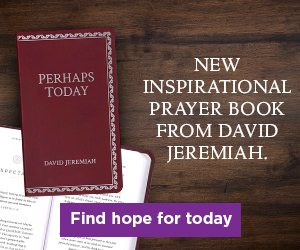 Dr. David Jeremiah is the senior pastor of Shadow Mountain Community Church in San Diego, California, and the founder of the international radio and television ministry Turning Point. Throughout his more than four decades of teaching God's Word, Dr. Jeremiah has written many best-selling books including: What in the World Is Going On?, The Coming Economic Armageddon, I Never Thought I'd See the Day!, and his brand new book What Are You Afraid Of?